Building an extension requires the skills of most of the trades. Starting with the groundwork's and drainage, through to the bricklayers, scaffolders, carpenters, plasterers, electricians, plumbers, roof tilers, internal tilers and finally decorators. Each project is different and we consider it is essential to establish a good rapport with you our customer to ensure the project goes as smoothly as possible and that we develop a full understanding of your requirements and expectations. This is particularly important when you remain living in the property which is often the case. Particular attention has to be paid to the Heath and Safety aspect of the build, even more so with children around, and to keeping the works as tidy as possible. Even before the building process begins we can help you from the very start of the design and planning stage. So please don’t wait to call H H Hilder as we can an advise and help from the very moment you have your first ideas about building an extension. We can provide advise on what is feasible and the different costs of various ideas to help in the decision on what ideas you would like to pursue. We work closely with various architects to take you through the design and planning stages and obtaining planning permission. If the extension is going to be built under permitted development we can advise on this and how to obtain a Certificate of Lawfulness from the Council so you can be sure that the extension you are intending to build complies with the rules of permitted development. If you already have an architect you wish to use we are very happy to work with them or simply step in when the final drawings are finished. The design and planning stages are a very exciting time and naturally also absolutely vital. 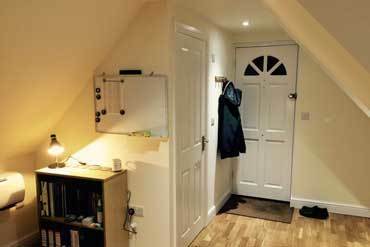 It is really worthwhile working with and architect or builder at this stage who is going to spend enough time and thought to work out exactly what you are looking for and the best way to achieve it. It can be very enjoyable spending time doing this and we are happy to help you as much as we can with this process. It may well be necessary to try out a few designs before you come up with the one you really want. After the planning or permitted development stage full working drawings need to be produced. These will need to be approved by Building Control usually run by the local Council but an Independent company can also be used. H H Hilder can produce all of these drawings for you if you wish and help you through the entire process including any party wall agreements that may be required and any build over permits required for existing drains from the relevant utility company generally Thames Water in our area. Electricity and gas meters may also need moving and permission is required for this. After the planning stage is completed and the building regulation drawings have been approved and building control inspections have been organised and paid for it is possible to start building. It is of course possible to bring in H H Hilder at this stage if that is the route you have taken. 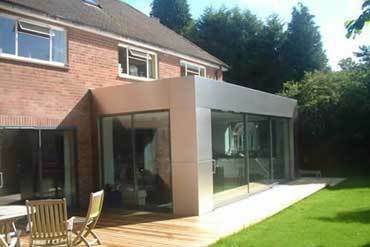 The whole process of building an extension usually takes about 12 to 16 weeks depending on how complicated it is and whether it is a single or double storey extension. It starts with setting out then moves quickly onto digging the footings and pouring the concrete. This is always an exciting stage as you can finally see the beginnings of your new extension taking shape. Hopefully it gets more and more exciting as the building works progress and you are finally left with your lovely new extension. The bricklayers then come in and build the footings up to the correct height ready for the floor to be installed, along with considerable amounts of insulation required under the floor. Any new drainage is usually completed at this stage as well. After the floor the bricklayers are back this time building the walls with carefully chosen bricks to closely match those of your existing house and always agreed with you first. Again, considerable amounts of insulation are required in the cavity usually now as a matter of course as dictated by the Building Regulations. The design of the insulation and materials use is dictated by the Building Regulations but how it is fitted will have an impact on its effectiveness so it needs to be fitted properly. Scaffolding will be erected which will have to be adjusted in height from time to time as the walls proceed. The joists, if it is a two storey extension, will then be put in place and after that the bricklayers continue to finish their work finally putting on the timber plate at the top where the carpenters join the roof to the walls. 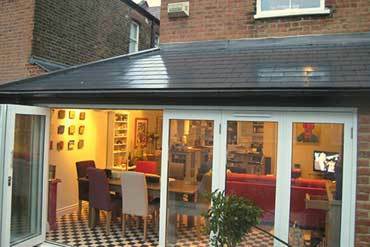 At this stage you will be getting a much better idea of how your final extension is going to be and how you will be able to use it and how it is really going to improve your living area. It is still covered in scaffold though. Any windows, French doors or bi fold doors usually get ordered at this stage as the holes left in the walls for these can be surveyed and the windows/doors have to be made. Top grade glazing is always supplied and is usually even required as a matter of course to ensure your house is as warm and snug as possible. The carpenters will now come in and construct the roof and fix the soffit and fascia ready for the roof tilers. Nowadays the roof will be covered by a breathable membrane to ensure better ventilation of the rafters to prevent damp. The roof tiles are then placed which again are carefully chosen to match in with the existing tiles. At this stage the extension is now ‘in the dry’ and it is possible to start first fixing. But just before that stage it is usually necessary to ‘break through’ and join the interior of the extension to the main house. This is always an exciting time as you can then really begin to see how your extra living space is going to integrate with the rest of the house. The structural steels, where required, are put into place at this stage as in the process of breaking through it is usually necessary to knock out sections of the existing walls of the house. This has to be done very carefully. It is now possible to start first fixing which means installing the new wires and getting the basic layout of the electrical system in place. It also means installing the pipes for heating, the water supply and waste water drainage. Crucially it also means that a number of final decisions will have to have been made as it is difficult to make changes afterwards. This will include all the final positioning of all items, types of sanitary ware, deciding the type of shower, electrical or pumped. The kitchen layout, and data cables, sockets, light switches, lights and positioning and security and this list is by no means exhaustive. It will also have been necessary to decide the type of plumbing system to be used, whether old gravity fed systems are replaced by unvented systems or combi boilers. In the case of loft conversions removing old water tanks is one of the first jobs to be carried out. Before we do start the first fix process we think at H H Hilder that even though it will have been discussed at length previously it is always a good idea to have a final look and double check that everything is as expected and is what you want. As at all stages H H Hilder will look carefully at what we are being asked to do and offer comments and advice. We won’t simply go ahead with what is on the drawing and we will always look to see if improvements can be made and not build or install things which we things are wrong or can be improved and even possibly not what you may be expecting. These types of issue are reduced if we are involved at the planning stage but even then it is possible you may have changed your mind or have different thoughts when the actual building can now be viewed. The first fix also includes the carpenter who will fix any stud work that is required, the frames for boxing, window boards and door linings. Again, this is not an exhaustive list. After plastering we move on to second fix and finals which is all the work after the plastering stage. During this phase you will really be able to see your house take shape and is a wonderfully trans-formative stage as you can see all of yours and our efforts start to come to fruition. This stage consists of fixing all of the electrical fixtures to the cables, sinks, baths showers connected to the pipes, doors fitted, kitchens fitted, internal tiling and finally on to decoration and fitting the very last items such as the door furniture. This stage is immensely important and has to be done to a very high standard and really forms the beauty of the building and is the final stage in delivering to you the house that you have been really hoping for. Your extension is now completed and you can finally occupy it. Well done to everybody involved.